Coercion and undue influence are two terms, which are commonly used in agreements and contracts involving different parties. The use of power and threats to convince an individual to agree or perform specific terms follows under the realms of coercion and undue influence. However, a significant number of individuals cannot tell the difference between both terms rendering them to use the words interchangeably or in place of one another, which results in confusion and lack of understanding. This article highlights the differences between coercion and undue influence as stipulated in various research studies. Coercion is a term used to refer to a situation where individual forces another person to agree to specific terms or provisions using threats. The party intimidates the other party to agree on certain terms against his or her will. Coercion may involve the threats to kill an individual, harming family members or loved ones, and torturing the person among other unlawful acts. The term undue influence is used to refer to the use of the position of power or influence to force an individual to agree to certain terms against his or her will. It is important to highlight that undue influence involves the use of authority and mental pressure to force a certain person to enter into a binding agreement. One of the primary difference between coercion and undue influence is the nature through which the two illegal actions are executed. 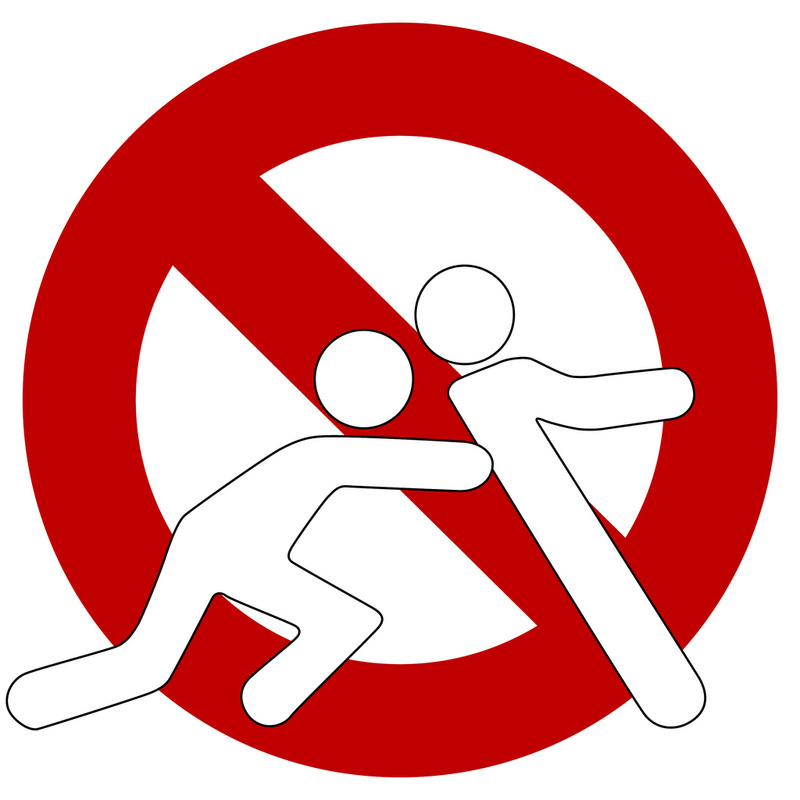 Coercion uses physical threats to force a certain individual to agree to certain terms against his or her will. It is important to highlight that coercion involves the physical force of violent nature to get consent. Some of the tactics employed in coercion include threatening to kill an individual and threatening to harm family members or loved ones. On the other hand, undue influence uses moral pressure to force a person to agree to a binding agreement against his or her will. The other difference between coercion and undue influence is that the parties involved are different. Intimidation is usually carried out by the parties involved in a contract or the agreement where he or she forces the other party to agree to the terms under consideration. Moreover, strangers are commonly used to coerce individuals to agree to certain conditions failure to which they will suffer specific physical injuries. On the other hand, undue influence has been found out to be carried by the superior party to force the weaker party to agree to the contract. People in authority have also been known to use their powers to force weaker individuals to agree to specific unfavorable terms. The other difference is that coercion is a criminal action, which is punishable under the law while undue influence is not a criminal act, which means it is not punishable by law. A person who gains consent through physical threats to unwilling individuals is punishable under penal codes of the Commonwealth countries and risks fine or jail term or both. On the other hand, undue influence is considered unlawful acts, which is not punishable under the penal code of various countries. However, it is important to highlight that, an individual who gains consent through undue influence may be charged under the court of law under the misuse of authority or positions of power to obtain approval against the will of a lower ranking party. Research studies have highlighted that the other notable difference between coercion and undue influence is that pressure does not require a prior relationship between the parties while undue influence requires a relationship between the parties under consideration. A stranger can coerce another party to agree to enter into a binding agreement against his or her will by use of physical threats. This is not the same for undue influence because a prior relationship is necessary for one to enforce his or he power to other low ranking individuals so that they can agree to his or demands. It has been recorded that senior members of the organization who possess authority and power have been gaining consent from other individuals through mental pressure. Besides, an older family member may use his seniority to obtain approval from junior family members. There arises a difference between indemnification and compensation if the coerced and unduly influenced parties report the matters to the authority. All the benefits and rights, which were received under coercion are supposed to be restored back to the coerced side such that they can go back to their original position, indemnification. Under the undue influence, all the benefits, and rights, which were acquired under undue influenced are to be returned to their original owner under the guidance and directions of the presiding court. Lastly, any party that alleges to have been coerced to agree to certain contractual obligations must prove beyond reasonable doubt to the court of law. It is not presumed by the law that a specific individual was physically forced to enter into a binding agreement. Under the undue influence, the court of law may assume that mental or moral pressure was used to force a particular party to agree to absolute terms. Additionally, the party against whom such presumption lies must disprove the allegations through justifiable evidence. 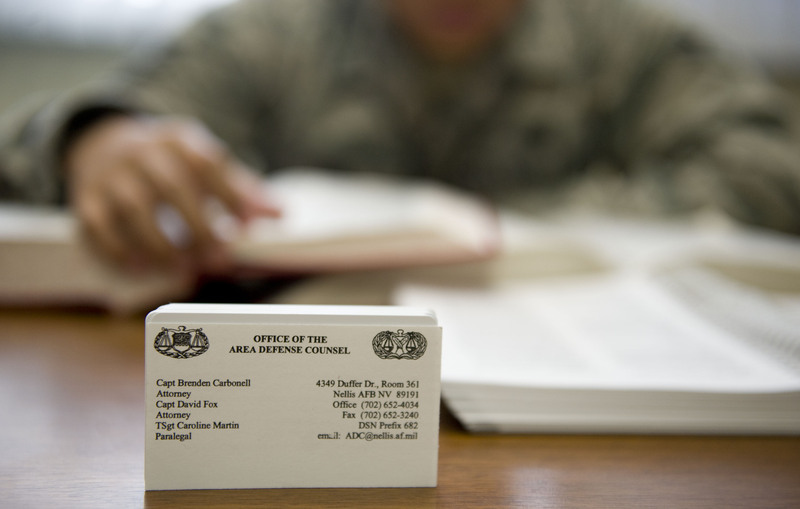 Coercion and undue influence are essential terms used in contracts that individuals ought to understand. People need to understand the meaning of the two terms so that they can be able to explain what they are facing in their respective areas rather than mixing between the two. Moreover, it is essential for individuals to differentiate between the two terms so that they can be prepared for any unforeseen eventuality. Jecinta Morgan. 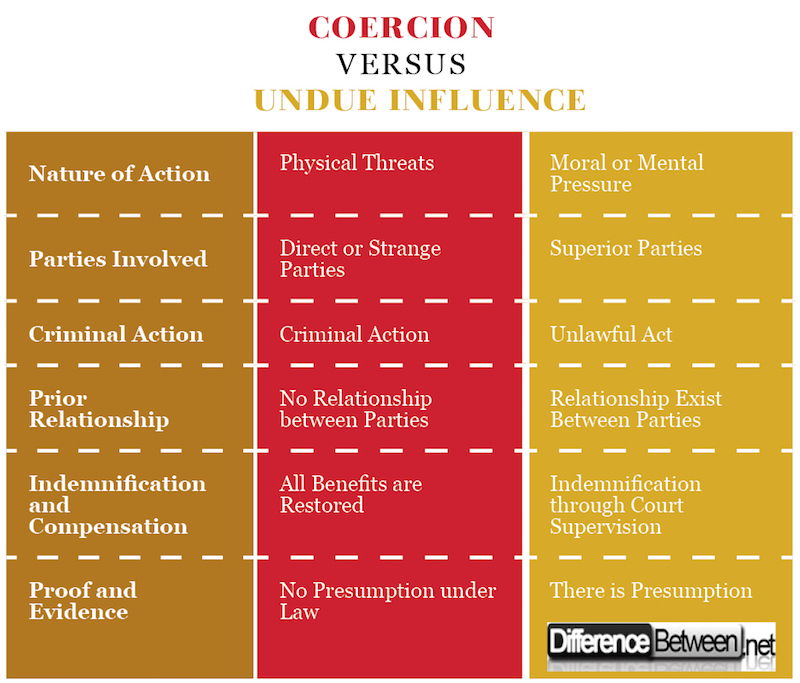 "Difference Between Coercion and Undue Influence." DifferenceBetween.net. February 15, 2018 < http://www.differencebetween.net/business/difference-between-coercion-and-undue-influence/ >. Hoffmann, John. "The Gramscian challenge: Coercion and consent in Marxist political theory." (1989). Panitch, Leo, and Donald Swartz. "Towards permanent exceptionalism: coercion and consent in Canadian industrial relations." Labour/Le Travail (1984): 133-157. Shulman, Kenneth I., et al. "Assessment of testamentary capacity and vulnerability to undue influence." American Journal of Psychiatry 164.5 (2007): 722-727.